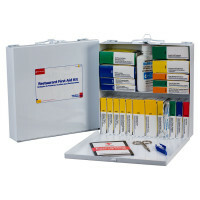 While a big kit with private, corporate, and catering kitchens, too, our Restaurant First Aid Kits and Restaurant First Aid Cabinets were specifically designed to meet OSHA and Department of Health guidelines for Restaurants and have special added considerations like blue bandages that will show if lost during food preparation and extra consideration for burn care first aid. 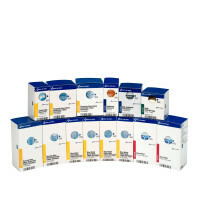 Whether you need multiple Restaurant First Aid kits at our discount and wholesale pricing, or a single Restaurant First Aid Kit and Restaurant First Aid supplies, you will find our osha restaurant first aid kits and commercial kitchen first aid kits meet all Federal and State restaurant first aid requirements. 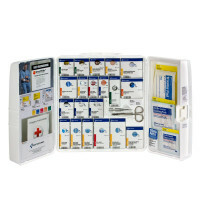 These kits were designed with critical kitchen first aid kit contents to server as a home or commercial kitchen first aid kit, as first aid kits for restaurants to meet restaurant first aid kit regulations/ We also have all you Restaurant First Aid supply items such as burn products, and restaurant first aid kit supplies such as blue bandages. If you need a Commercial kitchen first aid box, or Restaurant First Aid, be sure to select one with kitchen burn relief inside. 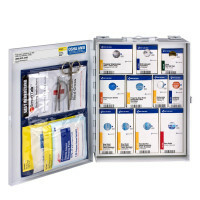 A typical kitchen first aid box or catering first aid kit contains all the basic kitchen first aid and food service items to care for an injury that may occur in food preparation. Restaurant first aid kit contents and restaurant first aid supplies should always account for possible injury to guests and diners as well. Catering first aid supplies, consider this as part of standard business as their work is in the field, but often Restaurant Managers overlook this when selecting 1st aid kits for restaurants. Food service first aid kits and kitchen first aid kit, should be viewed the same as catering first aid boxes and food service first aid supplies, if you face and osha kitchen inspection, the inspector will look to see if your osha restaurant safety accommodates adequate first aid items for your total capacity (as well as making sure your restaurant safety training, including restaurant first aid training are up to date.) Avoid osha kitchen violations by making sure your commercial kitchen safety equipment, or catering first aid box contents meet osha kitchens guidelines and that your restaurant safety program, and kitchen first aid procedure including kitchen burn treatment follow the osha kitchen safety guidelines. Prepare a restaurant safety checklist, with procedures like treating kitchen burns, kitchen burn prevention, and an overview of osha kitchen standards and osha restaurant standards. In outside food service, follow the catering safety standards as well as osha kitchen rules. Make sure your catering safety equipment, and commercial kitchen safety training are up to date and that you have your own kitchen safety checklist with restaurant safety tips, osha food standards, kitchen burn remedy information, and all other guidelines required for osha food industry, and the mandated osha kitchen safety checklist. Follow all osha kitchen regulations apply sound catering safety tips, get restaurant first aid posters and your catering safety plan should pass inspection for osha kitchen guidelines.